Recent blog:=- LiLo Back to Rehab? Haven dropped yet? Oh no!!! Ok ok I better check my LW PB soon… :) Find pics first! yest I dropped 200 plus only! paid ads at my blog?? Take pic of what la? Me cooking salmon or me wearing chef hat? LOL! I remember! yeah quite irritating but we can't do anything abt it oso.. I oso don't want to pay!!!!!! He he feel like wasting money like dat eh? u mean new text link from LW? Yay congrats WOAFS and Meows! Hugsy MPG! Hey Mon, Am I shhhhhhhh at TUO right now or not? LOL!!!! email oso asking abt advertising at my blog but I still haven't replied yet! hahahahaha yes u're shhhhhhhh at TUO right now!! LOL!!!!! me to write a post abt gen apple or sthing like that! Welcome! Got baked beans oso if u wan he he! Enjoy! hohohoho I love baked beans oso!! Hahahaha ok then good thing I sent brekkie your way, bon appétit! Okies, drinking coke now hohohoohoh! I don't like coke hehe! Eh u no like coke?? I like diet coke and vanilla coke! I see… I like seasons iced lemon tea, so refreshing! I have no idea what your post is about cos half the time I was looking at the pix and salivating ... hahaha! The salmon looks delicious. Guess we just have to moderate our salt intake, at least that won't deprived our taste buds from tasty and salty foods. OMG that looks awesome.. pandai nya R cook!!! i wan salmon!!! HAPPY 4TH DATING ANNIVERSARY TO MONICA AND RALPH!!!! when to ahem ahem ah.. lol!! Eating seafood is healthy. I like fish too. 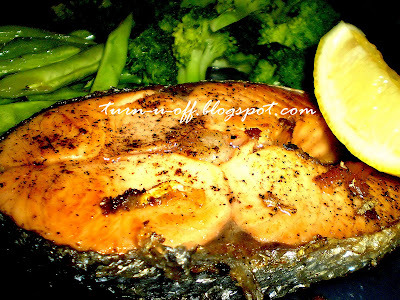 The salmon steak looks gorgeous!!! the salmon sure looks yummy. i wish my hubby can cook like that too. Recent blog:=- Wordless Wednesday - A great place for a relaxing drink in an inviting ambience. and you're so fortunate that Ralph can cook so well. i'm so envious of you. enjoy the rest of the week Mon. Lately, each time I visit your blog I get so hungry...lol. oh it tastes delicious Hitesh! :) what?? u can't even boil water?! LOL @ new unsangkarable followers! hahaha congrats Mariuca! Yay..
Hi Ayie! :* :* :* yum! yum! I love cooking salmon Mon.. have you tried it as asam pedas.. syiok! asam pedas salmon? I've never tried before LJ! salmon... so i try.. yumss.. sedaps!!! I just woke up Mon.. hehhe..
Hmmmmmm I think I won again cause just got some more followers but not sure how many…75 kut! I dropped 300 for meows and WOAFS but only up to Yeehah for MPG, serious couldn open eyes dat time edi… went inside mah room and terus zzzzzzz! Hmm yeah I really thought it was TUO, happy cause finally ur on my widget then I saw…JS!!!! Meow2 in less than 5 minutes! !